Lighting control platforms are inherently complex. Hundreds of components and technologies go into making a complete, cutting-edge solution. One of the most important of those components is the system’s mobile control app. It’s essential that you plan and implement the capabilities of your app with extreme care — whether you're building it yourself or sourcing it from a third-party provider. Knowing how important your mobile app is to the growth of your business, we’ve compiled our list of the top five things your app should do perfectly from the start, so you have the greatest chances of success. First and foremost, your app must nail the fundamentals — and that starts with initial discovery and configuration. In a best-case scenario, once the installation of all devices (luminaires, occupancy sensors, ambient lights sensors) is complete, the installer simply launches the app and taps a button to start commissioning a wireless networked control system. The app — interfacing with the lighting control gateway — begins discovering all devices on the network. Once all devices have been successfully discovered, the app should then allow for simple yet highly customizable clustering of devices into zones, and then the rapid creation of automated scheduling rules based on occupancy and ambient light sensors that are present in a zone. The app should also enable the same extremely fast discovery and configuration of new devices as they are added in the future. Be certain that future expandability is featured in your mobile app. The User Experience (UX) of an app is largely driven by design, but a good interface is just one element to ensuring a positive impression of a product. Mobile apps are complex, but even more so when they are dependent on a broader system of devices and technology. In a lighting control system, reliability means that a tap on a mobile device screen successfully (and immediately) adjusts the lighting within a specified zone to the desired level. The communication interdependencies between the mobile app, communications networks, gateways and end devices demand significant expertise and collaboration between app developers, embedded software engineers, cloud specialists and more. And every possible use case will need to be tested, at scale, to ensure that the product that is delivered to the field exhibits the ultimate in reliability. Anyone who has experience in launching mobile apps as a part of a complete control solution knows the challenge, but those new to such systems often underestimate the complexity. In commercial applications, the mobile app often plays a different role than in consumer applications. 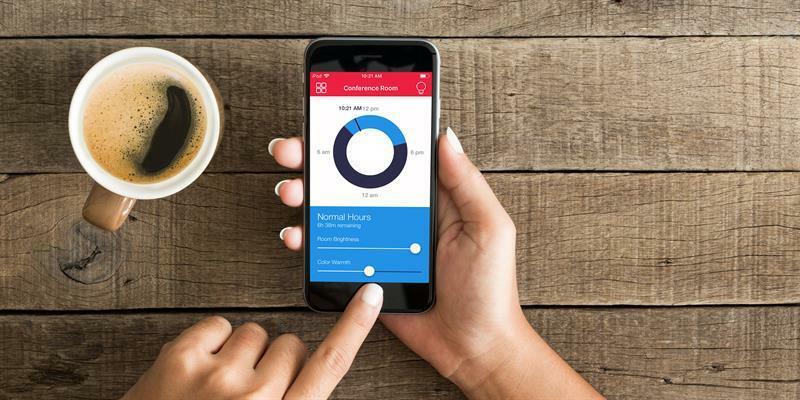 In consumer environments, such as in connected homes, mobile apps are typically used for installation, and then later as a common control option available to the end-user. Other options can include dedicated touch-screens, handheld remotes, and voice commands such as with Amazon Echo/Alexa (which we recently wrote about HERE) and Google Home. However, in commercial lighting control environments, the process often differs. The mobile app may be the only control interface that installers, designers and site managers have for project commissioning and configuration, but the automation of the lighting levels may mean that end-users have infrequent interaction with the mobile app and demand an intuitive user experience. Installers who use your app will have the same expectation for your UX as they do for all their other apps — it needs to be simple to use, or they’ll search for a different option. Additionally, app designers must take into consideration that the person who originally configures the system may never use the app post-installation, while those who do use it over the long run may have no idea how it was originally commissioned. Too often, control apps excel at one aspect or the other. They are terrific at the commissioning fundamentals, but are clunky and overly complex to use day-to-day. Or, they have a beautiful and easy-to-use operational design but fail miserably for the installer. Your app should be the best at both. Using a third-party app provider? Make sure they know your expectation on this and can actually deliver it. Perhaps less of a feature than an ongoing commitment to excellence, regular and frequent app updates have become a requirement in today’s world of ubiquitous smartphone use. Updates ensure that the latest functionality, new integrations, adoption of emerging UX best practices, adherence to evolving operating systems, and — perhaps most importantly — the most up-to-date security technologies are implemented to protect against constantly emerging threats. Updates are an absolute must for the entire system, and it’s no different for your control app. Make sure you are building in the necessary infrastructure and resources to conduct an ongoing cadence of updates. If you are sourcing your app from a partner, make sure they clearly demonstrate their capability in this area and explicitly show you how they have accomplished regularly occurring updates in the past. Last, but not least, is how the app looks. It is critical that the app matches your brand. A key reason in offering a lighting control system is to reinforce your unique brand identity and value-add. This is what differentiates you from other manufacturers that lack lighting control systems, and from third-party control manufacturers who are often more interested in advancing their own brand. Make sure that the app looks and feels as if it’s your own, ensuring that end-users associate the experience as an extension of your brand, and no one else’s. Successful smart lighting systems require a great deal of technology expertise. In the rush to implement the latest wireless protocols and hardware bells and whistles, many developers and OEMs often neglect the most front facing component, the software app that runs on the smartphones of installers, system integrators and end users. To ensure an effective app experience, it is important to integrate all the components listed above – reliable rock-solid commissioning and performance, a consistent brand experience, consumer class ease of use with business class reliability, standard look and feel that reinforces your company’s expertise and industry reputation and secure software updates that ensure that the system is always running at peak performance.